^ Liukkonen, Petri. 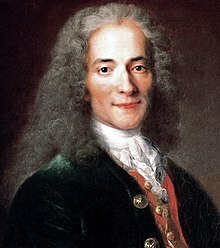 Voltaire (1694–1778) – pseudonym of François-Marie Arouet. [24 July 2009]. （原始内容存档于2015年2月17日）. ^ 5.0 5.1 The Life of Voltaire. Thegreatdebate.org.uk. [3 August 2009]. ^ 《李敖“难忘我是大陆人”》. 傅宁军. 新浪网. [2004年2月3日] （中文（简体）‎）. ^ Liu, Wu-Chi. The Original Orphan of China. Comparative Literature. 1953, 5 (3): 206–07. JSTOR 1768912. ^ 胡三元. 伏爾泰傳記: 世界名人傳記系列46 Voltaire. 谷月社.